Tuesday 13 May 2014 Dr Noel Patterson met with NGO representatives at CCIG’s office in Geneva to discuss his 3P Plan, which aims to address three major issues facing the world today: peace, poverty and pollution. 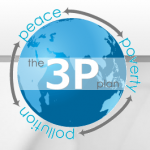 Dr Patterson discussed how the 3P Plan would tackle global poverty and pollution while making way for peace through a three-pronged intersectional approach by cutting global defense spending in order to use funds for humanitarian work and promote environmental protection. These funds would otherwise would be used for military expenditure, building up the world’s militaries and furthering the international system from attainable and sustainable peace. As described on the website, “[f]or less than 10% of the money that we spend on world-wide defence budgets annually ($US 1.63 Trillion), we could feed, house, cloth, educate and give proper healthcare to these children who are dying in such huge numbers.” With a “push from the bottom and pull from the top” approac h, the Plan proposes action to be taken by not only government representatives, civil society and the UN system, but also by people across all walks of life, regardless of their religious, political or national affiliations. 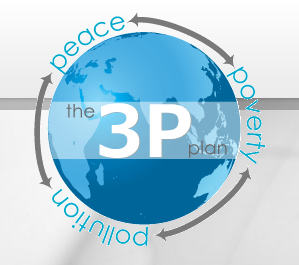 In the near future Dr Patterson hopes to meet with other civil society actors, organizational representatives and political actors to promote the 3P Plan internationally. For more information on the 3P Plan, please also see the Facebook page or the official website. No Comments to "Meeting at CCIG on the 3P Plan"